For many years now, Marvel has truly spoiled UK audiences by having their films come out here a week before most other places, including the US, meaning that us Brits get an early head start in enjoying the latest the MCU has to offer. But why on earth am I talking about Marvel in a review about a movie that’s as far away from superheroes as it possibly can get? Well, it seems that Disney has pushed back the UK release of Ant-Man and the Wasp to early August, a whole month after its debut in America, which has officially been blamed on the World Cup potentially snatching up all its audience were it still on course for a late June release. So, what is Disney replacing one of the summer’s most anticipated blockbusters with on this date? 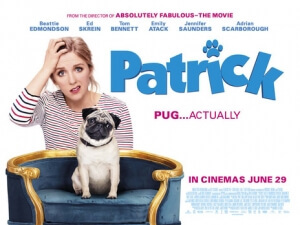 None other than Patrick, a movie about a little dog, which is clearly around to appeal to women totally disinterested in all that football malarkey, and has no other substance to its irritatingly cynical nature. In other words: they replaced Ant-Man with THIS?!? The plot is as tailor-made for the dog-lover and rom-com crowd as is humanly possible; it focuses on Sarah Francis (Beattie Edmondson), a hapless singleton whose life is consistently drab and awkward, much like any Bridget Jones knockoff figure ever, except significantly less vulgar so the film can earn its PG certificate. She also really doesn’t like dogs, which of course means that she ends up inheriting her late grandmother’s spoiled pug Patrick, and at first she naturally struggles with looking after him as he’s always causing a mess, eating things out of her fridge, and generally being a very bad dog. Eventually, because of course, she warms up to the little guy and soon finds that he’s helping her through life, including her new job as a school teacher, finding two potential suitors including a vet (Ed Skrein) and a nice fellow dog lover (Tom Bennett), and participating in a charity fun-run, since this movie needs something for its big climax. There really is no narrative focus to this film; it’s comprised of a series of scenes where either the dog is doing something cute, or Edmondson is gamely allowing herself to either prat-fall like something straight out of a cartoon or mug to the camera while trying to remain adorably aloof. Whenever it does decide to stick to one certain plot, the results are so laughably predictable and clichéd that it’s fateful attempts to be sincere and heartfelt (a minor sub-plot sees her interacting with a student whose parents are going through a rough separation) are actually funnier than many of the jokes in the actual thing. This movie’s idea of comedy is either, like I said, a number of prat-falls and moments of slapstick which Edmondson is largely game for, or very archaic British mannerisms that are either obvious or just don’t make much sense – at one point, Edmondson threatens to put an ad up for the dog on Tinder, which leads me to believe that these writers have no idea how Tinder works. The humour, as you can imagine, falls flat very often, and it can become so relentless and twee that it can become rather irritable very quickly, especially Edmondson’s character who frustratingly doesn’t seem to learn many lessons along the course of this film and has to have everything handed to her without her trying all that hard. I get the feeling that Edmondson, who in real life is the daughter of Jennifer Saunders (who has a small role in the film, alongside other veterans like Bernard Cribbins, Gemma Jones, Peter Davison and Adrian Scarborough, to name a few), is a perfectly fine actress, and she really is trying her best here, but the writing just doesn’t do her any favours and she’s left with a character that’s so clearly trying to be a child-friendly Bridget Jones that any other kind of personality trait just jumps right out of the window. It’s about every dog movie trope and light rom-com trope mixed into one blender, and it’s resulted in a treacly and saccharine movie that has a clear demographic in mind and will do anything in the rule book to ensure it gives them exactly what they think they want. This is clearly a cynical attempt to pander towards both women and dog-lovers that it ends up being disrespectful to both; sure, the dog is cute and all, but that’s exactly what the movie wants you to think, and it’s relying so heavily on its audience falling for its charm, to a point where they’ll be more forgiving of its lesser qualities. Unfortunately, they forgot to add anything else to it that would have made it far more endearing, like likeable characters which this movie largely lacks (again, Edmondson’s character is more frustrating than she is charming), funny comedy, and a plot that’s comprised of several scenes that just barely form a narrative. If you are indeed the target audience that this film is aiming for, then you’ll probably get exactly what you’re paying to see, especially if you’re in it for that dog (who, again, is admittedly rather adorable) – but anyone else who wants a distraction from the World Cup will be much better off watching anything else that isn’t as cynical and irritatingly ho-hum as this movie. Admittedly, it’s not the worst dog-related movie I’ve seen all year (thanks, Show Dogs), but for something so clearly designed to appease a certain demographic, it could have been a lot sharper and way more endearing. More than anything, I’m just annoyed that Disney bumped Ant-Man and the Wasp a whole month just so they could get this one out of the way. Was it worth it, guys? Was it really worth it? Patrick is a lame and cynical attempt to appeal to a largely female and dog-loving demographic that just doesn’t cut it due to its overwhelming lack of humour, real sense of endearment, and an irritating lead character who’s hard to fully warm to.